Now’s the Time - Stand and Deliver! Continuing the project to dig up and re-publish the older interviews, here’s another one with Mr Ross Noble. That strange Sunday catch-up with Ross Noble all those years ago began with a discussion of comedians we liked, before we actually tucked into the interview proper. At the time, I’d yet to secure a copy of Richard Pryor’s Pryor Convictions (and still have yet to do so). Ross owned a copy, he told me, in addition to many other books and videos fans of comedy would love. “The comedy shelf’s this deep,” he said, demonstrating with palms facing each other, a considerable distance apart, “about this tall,” jumping into the air to give me an indication, “and from about here” – indicating a starting point in front of him, before taking a number of big strides – “to here”. We agreed that, should I ever get it together to head to, say, the Edinburgh Fringe Festival, I would get in touch with Ross first, and pop in on my way. I certainly had an unreal time seeing the show and interviewing Ross afterwards in one of those chain coffee shops that had colonised the US and UK before they’d made inroads into this country (I’ll locate that minidisk and transcribe it – at the time, the sound recording was meant for ABC NewsRadio but my association with that station had ended before Ross returned to Australia and I could exploit the ‘exclusive’). I was given the opportunity to talk to Ross again, for FilmInk magazine, for the Australian release of Unrealtime on DVD – which must have been some time towards the end of 2005. I used a fair whack of the interview – not represented below – for an episode of Radio Ha Ha later on, and I’ll deal with the transcript of that some other time. For now, enjoy this. I can’t for the life of me remember what it was called when it was published in FilmInk. According to fellow comic Wil Anderson, just as filmmakers nowadays learn to make films by listening to directors’ commentary on DVDs, comedians will learn to do comedy by listening to Ross Noble’s commentary on his new Unrealtime DVD. Or at least, they would if they could get their hands on it; until recently, you could only get it from the UK or through Ross Noble’s website. Although the comic was launching it in person in selected HMV stores in the UK last October, it’s taken some seven months to make it to Australia. 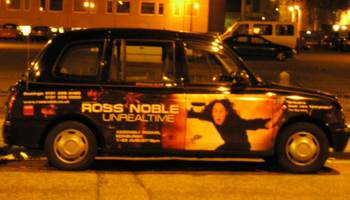 Now, the thing about Ross Noble’s comedy is that it’s never set in stone. Having first been a street performer who juggled and rode a unicycle, when he first took to the stage as a stand-up comic, the jokes were still the fillers between the tricks. But because this took place in the northern town of Newcastle, England, where comics were a lot thinner on the ground and the London variety proved too expensive to ship up, Noble got a lot of flying time as a stand-up comic. He’d MC a lot. When he finally started to ‘make it’ in London, it was as a warm-up guy for live studio audiences in-between and during the technical hitches of sitcoms. “It meant that I got to the point where I was comfortable enough on stage going on and actually genuinely talking and genuinely being funny without relying on jokes,” Ross explains. As a result, he learnt to have faith that no matter what came up and where he took it, he could always end with a flourish, impressively tying all the loose ends together. These are the skills the comic still utilises on the stand-up stage, bantering with the punters and looking as though he makes it all up out of thin air as he goes along. Even when he starts to do the ‘same bits’ – which in Noble’s case, means merely attempting to revisit the same topics and usually ending up somewhere else entirely – he never does them the same way twice. Why is all of this important? Only because you’ve got to wonder at what point you decide to record it for posterity. If you’re gonna make a DVD of a show that changes nightly, how do you decide that ‘this night is gonna be the one that nails it, that best sums up what it’s about’? The first show, Noble explains, took place at The Regent’s Park, an open air theatre “where they do Shakespeare and it’s all a bit ‘la-di-da’.” Having recorded that show, it was bunged on the shelf and duly ignored it. Two months later, Ross embarked on a month-long run at the Garrick Theatre in London’s West End, which culminated in a final night’s taped performance. “Obviously,” Ross says, “they’re two different shows. But they were basically recorded at the same time.” Rather than a document of ‘a show’, they form a snapshot, like a band’s live performance, of what took place on those respective nights. So, okay. How do the performances differ?